ISBN 1597730319. 5.25x7.5 inches. The one-row button accordion creates the defining sound that drives the waltzes and two-steps beloved by enthusiasts of Cajun music. Dirk Powell's step-by-step approach makes it easy to start playing immediately. He teaches how to hold the instrument, use the bellows, find the notes, and play ?double? (octaves) - the essence of the Cajun style. 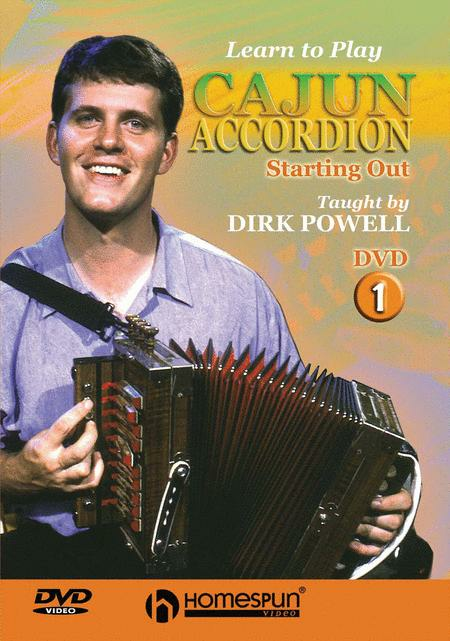 Includes detailed instruction for playing some of the most popular Cajun dance tunes: La Valse de Quatre-vingt-dix-neuf Ans (The 99 Year Waltz), The High Point Two-Step, Johnny Can't Dance. 75-MIN. DVD ? INCLUDES LYRICS ? NOVICE LEVEL.